On Thursday, June 21st, hundreds of shoppers gathered to find good deals at the Grand Opening of our new Hangers of Hope Thrift store. Nestled at 3826 Troup Highway by Super 1 Foods, the store represents a third location in Tyler. While the Loop store is the largest, the Troup Highway location has over 12,000 square feet and will eventually replace the South Broadway location, which will be phased out in the Fall. KVNE and Chick-Fil-A joined the festivities by passing out food to guests. KVNE had a prayer station outside the front doors, with coffee and donuts, while Chick-Fil-A brought chicken biscuits and the famous CFA cow. 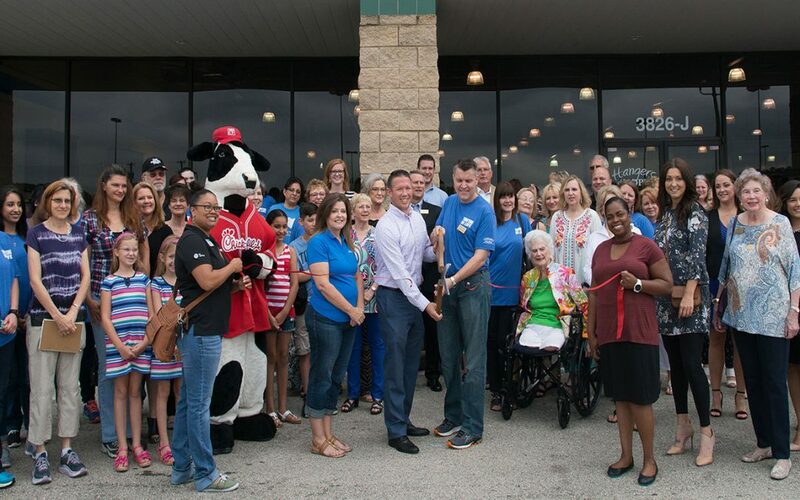 The Tyler Area Chamber of Commerce hosted a ribbon cutting at 9 AM, when Bethesda CEO Dr. John English and Bethesda Board President Ramsey Starks cut the ribbon to welcome shoppers to the new store. Members of The Bethesda Alliance served refreshments provided by Super 1 Foods. Hangers of Hope relies entirely on donated items from the community, and in turn offers great deals on clothing, furniture and household items.